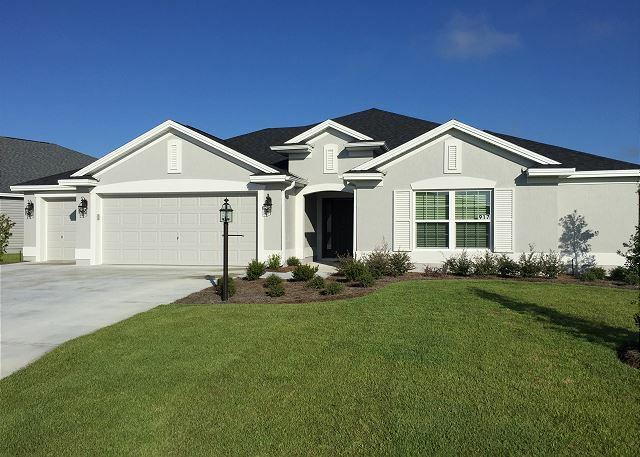 The Villages, Florida United States - 3 BEDROOM DESIGNER HOME THE VILLAGES FLORIDA 1 HOUR FROM ORLANDO | RE/MAX PREMIER REALTY Inc.
Nice large kitchen with a breakfast bar. Dining table seats 6. Living room features a 70" flat screen TV and recliners to enjoy your entertainment viewing. Dining area is connected to a gorgeous kitchen for your gourmet cooking. Master bedroom has a 50" flat screen TV, king bed, walk in his and hers closets, roman shower and dual vanity sinks. 2nd bedroom has a 60" flat screen TV that is for gaming only, king bed and adequate closet space. 2nd bath has a shower and tub. 3rd bedroom has a queen bed and an owner closet. Golf cart in garage is not for tenant use. There is a large grill just off the kitchen. No pets and NON Smoking home - TV has basic cable available for upgrade if you would like. There is also WIFI in the home. John S. from Gainesville, FL United States recommends this vacation rental. The home is very nice and well appointed. Overall, it was clean and orderly, however we had to rearrange some of the kitchen to make it suitable for our cooking preferences. I would recommend this property. Thank you for your review and we're glad you enjoyed your stay! A guest from sioux falls, SD United States recommends this vacation rental. We enjoyed our stay. The house was very clean and beds were comfortable. The neighborhood was very nice. Thank you for your feed back, we're glad you enjoyed your stay!